JACKSONVILLE, Fla., Oct. 3, 2016 /PRNewswire-USNewswire/ -- The shore in front of the historic Jacksonville Beach Lifeguard Station was mostly vacant, apart from large waves lifting a crisp, salty aroma into the air and wounded warriors carrying their surf boards. Injured veterans from all walks of life gathered in Jacksonville Beach in honor of a lost comrade, Navy SEAL Chris Campbell, who made the ultimate sacrifice five years ago. Through a final wish, Chris left a legacy – and a call to serve – that continues to honor and empower Wounded Warriors today. On Aug. 6, 2011, Chris was killed in action when his helicopter was shot down by Taliban forces. In his will, his family found a handwritten letter stating that if anything were to happen to him, he wished for 100,000 people to donate to Wounded Warrior Project® (WWP), to take care of wounded veterans who do return home from combat. Chris' story quickly spread throughout the nation. Soon after, his family joined hands with WWP, and they began the steady journey to fulfill Chris' last request together. Touched by the warrior's love for his service brothers and sisters and strengthened by his family's resolve, WWP sent out a unique appeal to donors: a letter, detailing the final wish of a warrior, and inside the same envelope, a different request – this one from WWP – with a small patch of cloth intended for an even more personal contribution. Nationwide, several hundred generous supporters donated to WWP in honor of Chris and his legacy. In celebration of Chris' life and the shared mission to honor and empower Wounded Warriors, WWP hosted a ceremony on a day of no small significance to his family: Sept. 16, 2016 – Chris' 42nd birthday. Wounded warriors gathered on the beach ready to take part in one of Chris' favorite hobbies – surfing – all in front of the lifeguard station, in tribute to a job Chris loved before he joined the Navy. Attending the ceremony were two guests of honor: Chris' mother, Diane Campbell, and sister, Cindy Campbell. In tribute to his legacy and his family's tireless efforts to fulfill his final wish, WWP made a special presentation to the Campbell family. Like the bonds of a promise, the pieces of cloth were sewn together to make something bigger than any one promise alone. Two large American flag quilts comprised of hundreds of small messages – words of condolence, gratitude, hope, honor, patriotism, support, and love. Diane and Cindy stood arm in arm inside the small lifeguard training area used for the ceremony. Their emotions filled every square inch of the room as their hands and eyes scanned every square patch of the flag. "I am humbled," Diane said about the outpouring of support. In a voice expressing equal parts awe and gratitude, Cindy said: "There are no words. What can you say, other than 'thank you'? Because we cannot carry his legacy on alone. I mean, one hundred thousand people [donating]? That's huge. So it's the American people who will make this happen –"
"Across the nation," Diane finished. Not only are Diane and Cindy undaunted by that number, they welcome the expansion of Chris' legacy, one selfless donor at a time. Cindy, who stood by her mother near the flag, carefully pulled out her brother's combat boots from a shoulder bag she protectively carried. "I take these with me everywhere," she said as she placed them down beside the flag and pulled out a photo of Chris blowing out the candles of a birthday cake. The family believes the photo was taken on his 36th birthday – just before he deployed. 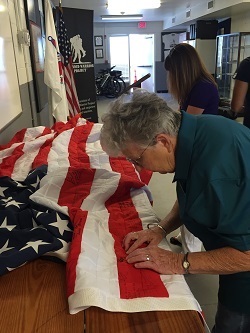 "Everyone who has donated – who has signed [these flags] – is part of our family," Cindy said. "And as we celebrate Chris' 42nd birthday, what a tribute of the American flag, which represents not just freedom, but what he stood for and what he died for. What an amazing gift." But the gift is symbolic of the support Chris continues to give his family and brothers- and sisters-in-arms. "And the greatest casualty is being forgotten," Diane finished. "When you meet people," Cindy said, "and you're able to look them in the eye and they say 'if it wasn't for this organization, I would not be here', I mean, how do you put words on that? Every life is valuable and precious, and those who serve our country – for what this flag represents and stands for – and they come [home to] Chris' legacy and the donors who are a part of those hundred thousand people. The money is used for some amazing programs and services. We are grateful. Because they are not only helping the warriors, they are helping us by sharing our stories and they are remembering Chris…"
Although Cindy emphasizes the importance of organizations like TAPS (Tragedy Assistance Program for Survivors) that help comfort survivors through the loss of loved ones, she explains why WWP's embrace of her family after the loss of Chris is so profound. "For me," she said, "this partnership with WWP has been equally as important, because generally, WWP is for those men and women who come home. Sharing Chris' last request, it's as though we have come under that umbrella of support as well. Meeting men and women who serve our country who have benefited from what my brother put out there as his last request is incredibly helpful." To date, nearly 12,000 generous donors have contributed to WWP in honor of Chris Campbell's final request, funding programs and services that fulfill WWP's mission to honor and empower wounded warriors. Those who want to make a gift to help Chris and his family reach his goal can do so by either visiting WWP's online donation page here or by mailing in the gift with a small correspondence that includes Chris' Memorial and Honorarium information.